**Update** We just heard that the Intense Carbine now features ISCG tabs as well as Stealth routing for your seatpost, and they're in stock in New Zealand right now! 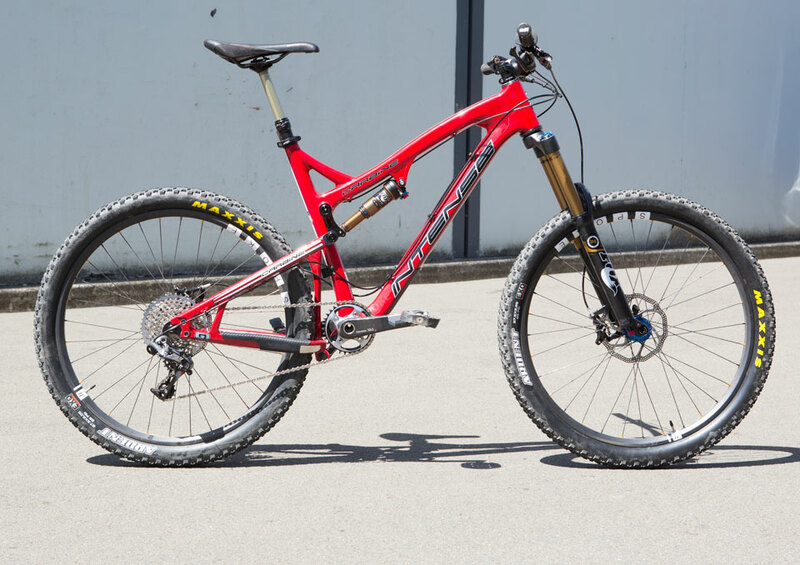 After discovering the joys of the 650b wheel size on the Scott Genius 720, Spoke reviewer and columnist Rod Bardsley decided he wanted to up the bling factor a little so started building his 650b dream bike. Enter the VPP-equipped Intense Carbine. It's the exact same frame for the 26'' model but you buy slightly different dropouts to accommodate the medium sized wheel. The Carbine is an adjustable travel all-mountain bike that flips between 140 and 152mm of travel, other than the adjustable travel everything is pretty standard; dropper post routing, tapered steerer etc. Rod's been on the bike for a few weeks now and won't shut up about how rad it is. We've been running XX1 on one of our test bikes since August last year but Rod was feeling left out so decided to step up to the plate and commit, and he hasn't been disappointed. Although on a little ride this morning he was thinking of having two rings in his arsenal, given how easy they are to change, so has ordered a 28t ring to go with his 32t. The G1 rear dropout system is obviously the key to the switch between 650b and a standard 26" wheel. But it also means that the Carbine is insanely versatile as the dropouts are available in standard 135 QR, Shimano's 142 x 12mm as well as Syntace's 142 x 12 system. And I should have mentioned that the xx1 XD Driver body is mated to a set of sweet Hope Pro II hubs... Yup that's right if your rocking Hope Pro IIs (which I reckon half of NZ is) then you can now rock XX1! Super low standover height. Angular contact bearings. Some very cool looking carbon, adjustable travel and a boost valve custom tuned FOX CTD rp23. Oh and I spy cable routing for a dropper post too—no stealth hole—which is pretty much the only downside to this whole bike! Up in the cockpit Rod has decided that 800mm is the new 760mm and is refusing to cut down his very bling ENVE DH bar (attached to a black on black 2013 Easton Haven 65mm stem). You may note he has customised a nice little doohickey from a V-brake to help improve the cable on KS Lev. I guess it had to happen. Intense have released photos of their latest project. Will we see Palmer on one of these soon? Mt Victoria Super D - The mostly downhill cross country race.